Dr. Yemane, AIRS Chief of Party, Ethiopia. Dr. Yemane doesn’t shy away from a challenge. In order to study the African mosquito for his doctoral research in infectious disease at Harvard University, Dr. Yemane flew mosquitoes from Ethiopia to Boston (with approval from the Center for Disease Control and Prevention). To provide the insects with the regular blood meal they needed to reproduce, he fed them from his own arms. 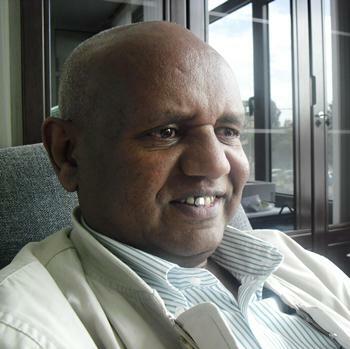 As the chief of party for AIRS Ethiopia, he says solving problems during hectic spray campaigns is the “most exciting” part of his job. Since joining AIRS in December 2011, Dr. Yemane and his team have planned and executed successful IRS campaigns in 36 districts in Ethiopia, spraying more than 500,000 structures and protecting more than 1 million people. We talk to the chief of party to learn more about his passion for fighting malaria and how he’s making a difference in his home country. AIRS: What made you decide to work in malaria control? Dr. Y: Before the 1990s in Ethiopia, all university graduates were assigned to different offices by the Central Planning Office of the government. Most of my classmates were sent to the Ministry of Education to be teachers in different provinces. Due to my good grades and a bit of luck, I was sent to the Ministry of Health to work at the headquarters of the Malaria and Other Vector-borne Diseases Control Organization. At the Ministry, I had several different jobs. I worked in vector biology, epidemiology, and entomology before leaving the organization to pursue my master’s and doctoral degrees. Though I did not choose my placement, I had personal interest in fighting malaria. I lost my mother at the age of three or four; I have no memory of her. I grew up hearing my relatives talk about how my mother died. They said she was very febrile, and they suspect that she died of malaria. I guess health services were far from our small town and malaria care was not available at the time. In part due to my personal experience, I have grown very passionate about malaria control. AIRS: What gets you excited about going to work in the morning? Dr. Y: The two to three months of the spray operation period is very exciting and challenging. The best part of my mornings is meeting with staff to discuss spray progress and solving problems that affect the operation of the campaign. Knowing my team, my institution, and I are doing something that greatly contributes to protecting people (a large portion of them women and children) from getting sick and dying of malaria makes my day-to-day work enjoyable. AIRS: Tell me about your work with AIRS in Ethiopia. What accomplishments are you proudest of? Dr. Y: I am proud of the good working relationships the team established with the national and regional health offices. We also built close relationships with district staff. This was particularly helpful during the second spray round, allowing us to have an open dialog about the project’s role and responsibilities and those of the district staff. I am also glad to be involved in a pilot project, testing how IRS can be further decentralized to the community level. In my previous employment at the Center for National Health Development, I was responsible advising the Ministry of Health on the implementation and monitoring and evaluation of the health extension program. I was a strong advocate of the Ministry’s plan to decentralize IRS to the community level. At the time, it had never been tested. I am glad that this is part the AIRS project in Ethiopia. I think it will have a significant implication in shaping policy on implementation of IRS in Ethiopia. AIRS: We are always looking for ways to make IRS more efficient and effective. Can you think of any examples from AIRS Ethiopia? Dr. Y: Several come to mind. Most importantly, we are using existing government structure and health workers at the zonal and district health offices as well as health extension workers at the community level to help implement the spray campaign. With continuous support from the AIRS team, the zonal and district health staff train spray operators, washers, and guards; manage day-to-day implementation; and supervise spray operations. We provide them with training, which prepares them to meet PMI standards for spray quality, environmental compliance, personal safety, and supply management. These zone and district health office staff are hired by AIRS for a daily per diem for the duration of the spray campaign (about 35-40 days). This is a much more efficient use of resources than hiring employees for the full year since the spray campaigns only last a few weeks. This system is also very important for sustainability because local staff are developing the skills they need to implement and supervise spray campaigns in the future. In addition, we mobilize health extension workers, who are permanently based in the villages, to build acceptance of IRS by the population. This makes the work of the spray teams easier and faster. Once beneficiaries understand how IRS will protect them and their families from malaria, they actively help prepare their houses for a successful spray campaign. AIRS: What do you enjoy doing outside of work? Dr. Y: I have four young kids. Listening to what they have to tell me about school and their friends, answering their tons of questions, and playing with them is my favorite stress reducer.